Xerox’s 'Breakthrough' Solid Ink Color Printers: Should You Care? Xerox today launched a new series of pricey office printers that use solid ink instead of cartridges. With prices starting at $23,500, the ColorQube 9200 series is obviously targeted at high-end corporate users, and is designed to significantly reduce the cost of printing color pages. 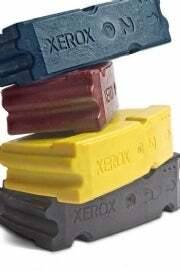 The Xerox Phaser 8400, launched in 2004, also used solid ink. With a $999 price tag, it was considerably more affordable for small offices, but the technology never really took off. A PC World review of the Phaser 8400N gave the printer a "Poor" rating and said the waxy, solid ink "scratches off more easily than does plastic toner fused to paper." But Xerox says it has completely overhauled its solid-ink system, resulting in faster performance and higher print volumes. Each ColorQube 9200 model has four print heads and churns out pages at an impressive 38 page-per-minute (ppm) to 85-ppm range. The price-per-page breakdown is complex-you can read the specifics here-but Xerox's specs do look impressive on paper. For instance, a page with heavy color coverage, such as a real estate flyer, should cost about eight cents to print, the company says. Xerox still sells a sub-$1000 solid-ink printer, the Phaser 8560, but IDC printer analyst Keith Kmetz says it's unlikely the company will want to renter the hyper-competitive consumer printer market anytime soon. "That's not Xerox's direction," says Kmetz. "Xerox's focus for the technology is on the office (more higher priced), rather than consumer. Xerox played in the consumer market years ago and suffered for it." It's a shame that Xerox's solid-ink technology is strictly targeted at enterprise users, as consumers could certainly use an affordable alternative to ink jet printers and their overpriced-and often wasteful-cartridges. Let's hope Xerox will bring ColorQube to the consumer side in the near future.